CPT composite panel systems are manufactured using a sandwich structure and can be engineered to a customer’s unique specifications. A composite panel is built using strong sheets of surfacing materials separated and bonded against a specially engineered lightweight core center. 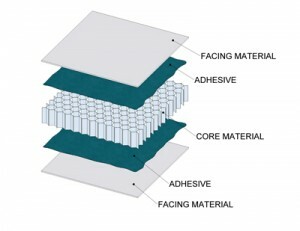 Composite panels are bonded using CPT’s unique kryptonite adhesive technology. Composite panels commonly replace wooden structures or other types of paneling. CPT’s innovative composite panel systems provide a lightweight structural solution with tensile strength allowing for diversity in design for a vast array of industrial and commercial applications. CPT offers customers the largest range of core, facing and coating material options to create the perfect composite panel for your application. Keeping pace with our customer’s needs and their market’s demands is important to us. The customized composite panels and systems we provide offer customers an innovative solution that takes them from concept to production quickly. Our technology and processes provide the strongest bond line between our facing and core materials and we build the best quality composite panel available in North America today.